The town's brick-paved Broadway is now on the National Register of Historic Places and is a fun diversion for travelers on the Mother Road. Read the historic marker in front of the post office, denoting that the town started as a stagecoach stop and rural trade center in 1891. 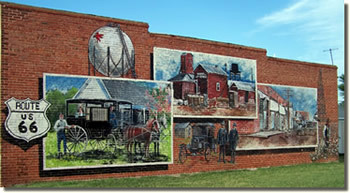 There are two large murals on two historic downtown buildings that depict nine scenes reproduced by professional artists from actual photos from the early days. 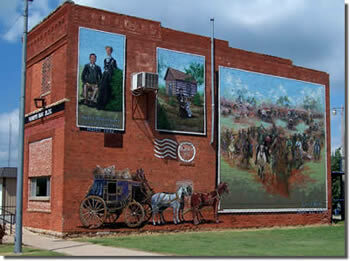 The 1891 Land Run scene from Harper's Weekly is the tallest mural on Route 66, soaring 32 feet high on the south side of the 1905 Farmers Bank Bldg. Other scenes are of Nettie Davenport, first postmaster and namesake of the town, her log cabin post office, oil boom scenes, cotton fields and business views. Old photos are on display in City Hall, as well as an original painting by Nettie Davenport, and Central Oklahoma Telephone Co., the local independent phone provider in business here since 1904, has its original switchboard and old phones on display. On the Route 66 curve in Davenport, one of the few original wooden frame "cottage style" filling stations built by Magnolia (later Mobil) Oil Co. in about 1929 at 8th and Broadway can be viewed, as well as the restored 1933 Texaco filling station at 7th and Broadway that has an awning complete with recessed tin ceiling. One of the bay doors is covered with collectible license plates from the 1920s and 1930s. All these sites make great photo ops for the Route 66 traveler. A mile north of town, just a half mile off Route 66 on the old Ozark Trail (the original Route 66) is the 1925 spherical Magnolia Oil Co. storage tank -- the first such round steel oil field tank built in the world. One can still faintly see the trademark red Flying Pegasus on the side. Davenport was the site of one of the state's largest oil booms in 1924, and still is an area of large production today. Four miles northeast of town on the Ozark Trail is one of the original concrete obelisks on the old dirt U.S. 66 alignment. Watch for a small sign giving directions two miles west of Stroud. "Nettie Davenport Day", an annual celebration honoring the town's frontier heritage, is held on Mother's Day weekend in conjunction with the high school alumni reunion, one of the oldest such reunions in the state. The Community Fair is held the week before Labor Day each year.